Secretly, I've been hoping that my blog would make the "Blogs of Note" list on Blogger.com. I did not, however, consider the possibility that my video website would be promoted in any way, so I haven't worried about what I posted there. I have mainly shot stuff for myself and/or the folks "back home" that know me. Yesterday, Didge and I went for a long walk to enjoy the 50-ish degree weather. (Today is just as nice ... it's really amazing.) After wandering around our neighborhood for a while, I got bored and decided to get on the métro at our next opportunity. As luck would have it, I found a stop on the #13 line, which goes straight to where I ultimately wanted to end up: Les Champs-Elysées. My main goal -- other than enjoying the "beau temps" and photographing my pseudo-kid -- was to scout out good spots to look at Christmas decorations. Since I know people who "dream" of being in Paris for Christmas, I want to make sure that I have the full "dream" experience. As you can imagine, Les Champs-Elysées did not disappoint. (After all, it's a MAJOR tourist destination, as well as the home street for a lot of really pricey retail stores.) I'm planning to go back up there one night this week to get pictures and video of everything lit up, but even during the day, everything was just gorgeous. What surprised me the most about our walk was that the dominant language spoken was American English. It's not that I was surprised to hear English per se, but more that I heard almost exclusively English, and American at that. Honestly, I expected to hear a mix of languages, or at least more British than American, given the proximity of the countries. Strangely enough, I found that I didn't like hearing American English. (As Rachel puts it so eloquently, it sounds like a broken oboe in the middle of a beautiful orchestra.) I wanted to hear French, and I wanted to speak in French. This wasn't quite the reaction I expected to have, but hey, that's what happened! My favorite part of their job is when they flood the streets. As you can see in the "Christmastime in Paris" video, there is water draining down the side of the street. It's not from a rainshower or snowmelt, but from someone deliberately opening a valve to release water into the streets. 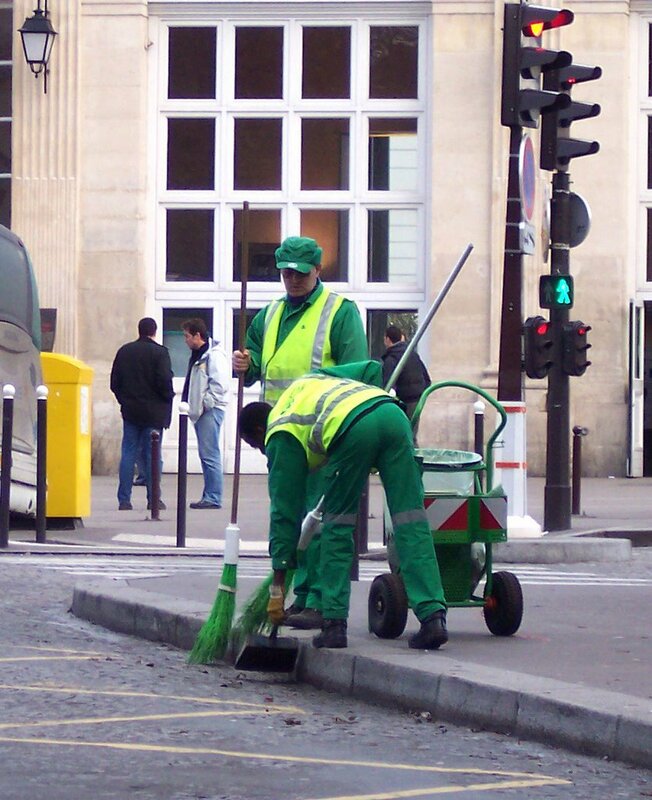 Then, the nice men in green come by and sweep away anything that doesn't automatically float away on its own. It's an ENORMOUS job to keep the streets clean (especially with all of the people who don't pick up after their dogs!). I always want to thank the green men for their hard work, but I'm sure it would come across as condescending and rude. Instead, here is my tribute to these folks: thanks, guys!! You are appreciated! It's funny, but when I first came to Paris as a teenager, I hated it. I thought it was small and dirty. Now, I can see how marvelously clean it is, even though the buildings can sometimes look dingy. What else can you expect from a city is more than 2000 years old? Of course, there will be some dark spots. It's just not going to look like a shiny new penny! 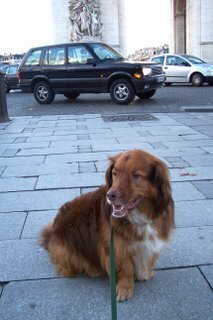 Alas, despite the beauty of Paris, there's no accounting for personal taste. 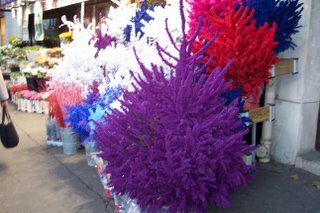 Just when I thought I might have escaped a season of hideous Christmas trees, I stumbled upon this collection. 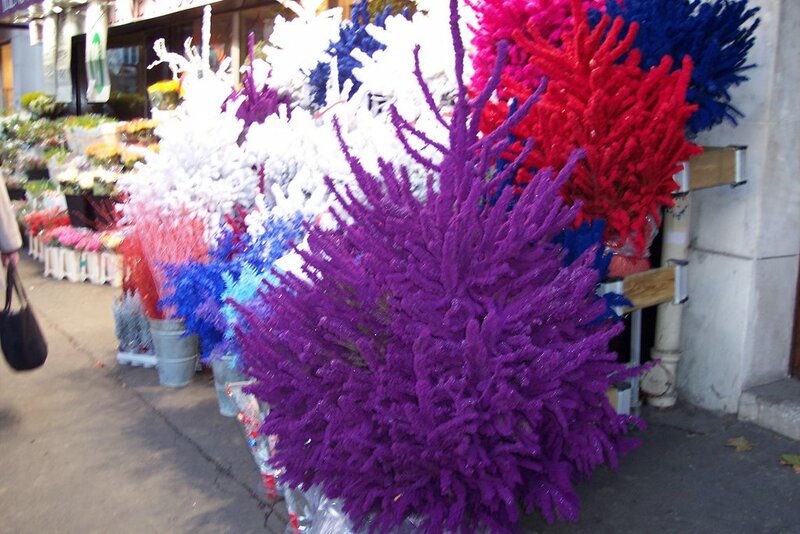 Apparently, red is one of the hot colors for Christmas trees in Paris this year. But, if purple, blue, or white is more your thing, no problem! I never thought I'd say this, but given the options, I'd prefer one of those fiberoptic trees that they sell in American malls. Bleah.